Living the Good Life and filling it with JOY, ADVENTURE, and COLOUR! At the end of January, I abandoned my family and headed off for a Ladies’ Week with my friend Gayle in Quito, Ecuador. Gayle and I met 15 years ago at an environmental education centre in Minnesota. Gayle is from the UK, but is in Quito for a few months as she conducts her PhD research (on inclusive urban mobility/transportation). Since we were going to be so close to each other, I decided to head down to see her. Señor Luma, Lumita (when she was all of 9 months old! ), and I went to Ecuador in May 2007, but we hardly spent any time in Quito so I felt like I was headed there for my first time! Let me just start by saying that Quito is FABULOUS! Friends of mine had been RAVING about it during (and after!) their time there, and so I was quite excited to have a whole week all to myself with a good friend. And after a year of being together (pretty much all. of. the. time. ), it was nice to head off on an adventure, alone! And while I do love travelling with my family and spending time together, it was so gloriously nice to go away and not have to worry about anybody, other than myself! And to be fully transparent, my family would not have enjoyed all of the wandering around the historic areas of Quito, visiting a basilica, standing around and watching the changing of the guards at the Presidential Palace, wandering around the artisan markets, etc… There would have been whining (from the Lumitos) and frustration (from Señor Luma). Rather than blather on about all I did, why not browse through some of my favourite photos from my week (hover over the images to see the captions). The view from Gayle’s apartment balcony in La Ronda. Roof tops from the historic district. We got caught in a wicket rainfall our first day exploring. Later that night, we bought a cheap umbrella from a street vendor and carried it with us daily – and had no more rain for the rest of the week! The Basilica. You see the tower on the left? 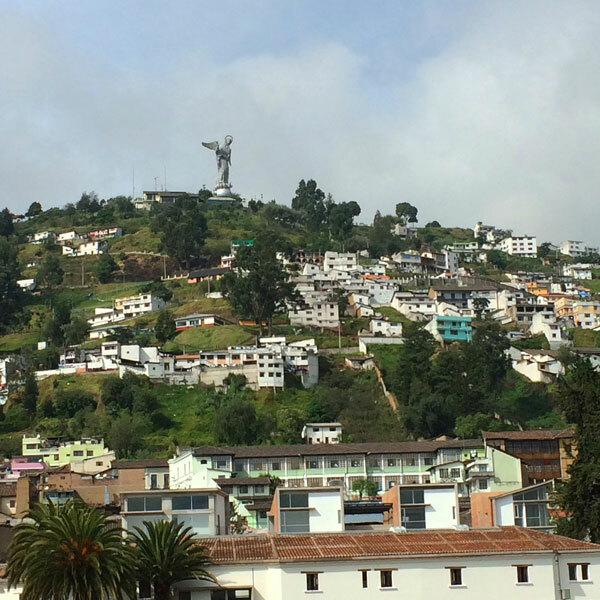 I climbed up it to get a great view of Quito! The main window of the Basilica. Walking through the rafters of the Basilica (so cool to be up there!). We found a lovely boutique with beautiful locally handcrafted items. Waiting for the changing of the guards at the Presidential Palace. Beautiful courtyards to discover in La Ronda. Lots of pigeons in the Plaza San Francisco. BUBBLES! (we really are just big kids!). An action shot of me trying not to pop the big bubble! The view of the Andes mountains while flying out of Quito. Such a wonderful trip and so wonderful to spend some fabulous time with a great friend! This entry was posted in Living the Life. Bookmark the permalink. Never want to miss a post?? Follow the Luma Notebook via email and all posts will arrive directly in to your inbox! We are all working like busy little bees to be ready for you!! As if you needed ANOTHER reason to shop this Saturday at the @finerthingsshow!! ☺️ . #Repost @finerthingsshow ・・・ Shop to win!! This year, each time you shop from 3 vendors, you will get a chance to win! Our amazing vendors have each donated an item to the gift baskets - I’m all 😍😍😍 over here with all of these amazing donations!